Likewise, physicians don't know why car sickness affects some children more than others. While the problem doesn't seem to affect most infants and toddlers, children ages 2 to 12 are particularly susceptible. A study by the genetics company 23andMe also identified women and people who get migraines as two other groups more likely to suffer from motion sickness, and it also found connections between the car-sickness-prone and poor sleepers. In addition, there is some evidence that some people who take certain kinds of medications, including some antibiotics, asthma medicines, and even over-the-counter medicines like ibuprofen, are more prone to car sickness. Avoid greasy and rich foods and spicy fast food before or during your car trip. If your drive will be short, try to avoid meals altogether until you reach your destination. A small, bland snack such as plain crackers and a few sips of water is less likely to trigger an upset stomach. Many people swear by these two natural remedies when it comes to preventing nausea. Queasy Pops, Queasy Drops, and Queasy Naturals are candies flavored with ginger, peppermint and other calming ingredients that were created specifically to ease a queasy stomach. And the book, movie, and coloring pages. The most popular theory about what causes the dizziness and nausea of motion sickness is that riding in vehicles delivers mixed signals to the inner ear, thus causing confusion between the senses. When your child plays a video game or reads in the backseat, his eyes are focused a few feet away, which sends a signal of stillness to the brain. Meanwhile, the inner ear picks up on the motion of the car. When the eyes and inner ear send mixed signals to the brain, the resulting conflict can cause nausea. Interestingly, the exact point where the eyes are focused seems to make a big difference. Researchers at General Motors even identified a "puke zone" regarding the placement of the car's video system that seemed to make backseat passengers more likely to feel sick. Encourage your child to look at things outside the car—but through the front windshield instead of through the side window. Focusing on a distant point on the horizon tends to help. Air ventilation with fresh air from outdoors can also help prevent car sickness. If your child is prone to car sickness, try playing car games or have her listen to music with her eyes closed. If your child signals that he is feeling sick, try to pull over at the nearest rest stop and let him get out and walk around. If you have a cooler in the car, placing something cool on his forehead may help. For some people, applying light but firm pressure to the inside wrist can help. If your child is older than 2 and prone to car sickness, ask your pediatrician about an over-the-counter medication to prevent nausea on long car trips. Dimenhydrinate (Dramamine) is approved for kids age 2 and older, and diphenhydramine (Benadryl) can be given to kids 6 and older. Read the product label carefully to determine the correct dose. The most common side effect of these types of medication is drowsiness. 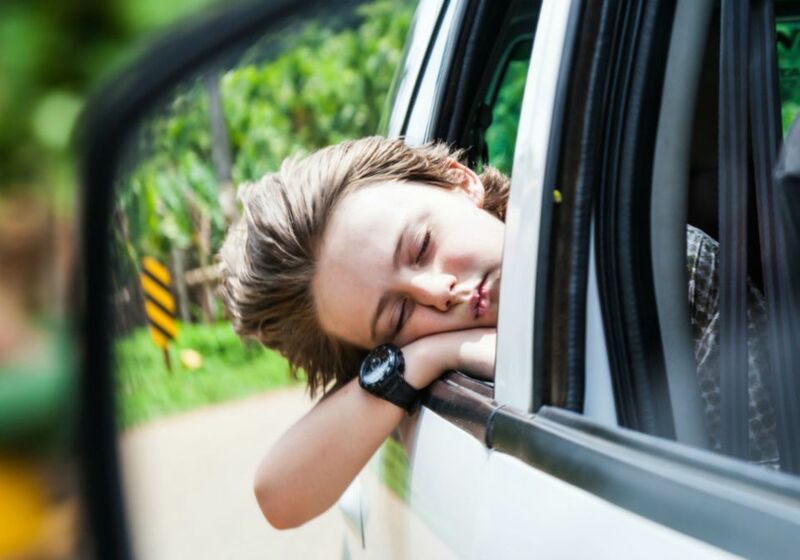 The good news is that most kids tend to outgrow their car sickness by the time they are 12 years old. In the meantime, hopefully, some of these tactics will help. Got Young Kids? Discover the Best Theme Parks for Them.